“In addition, Taiwan Province of China has become an important source since 2016. "Data on seizures, prices, use and treatment all point to continuing expansion of the methamphetamine market in East and Southeast Asia", said Tun Nay Soe, UNODC Inter-regional Programme Coordinator. "Seizures of methamphetamine in 2018 were once again a record, yet street prices of the drug decreased in many parts of the region indicating very high and increasing levels of availability." 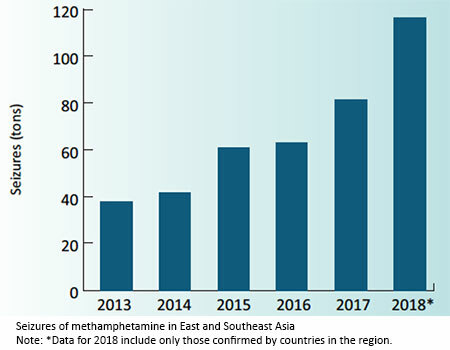 The scale of the increase in seizures of methamphetamine has been significant across the region, but in particular in countries of the Mekong. 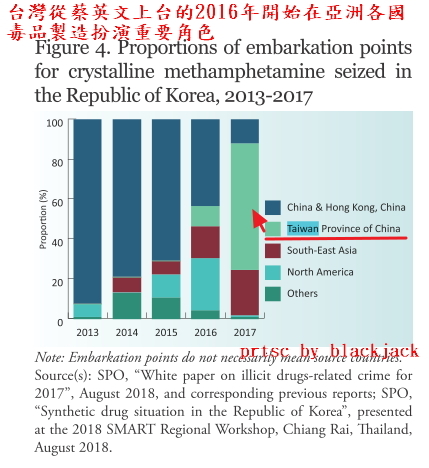 In Thailand alone 515 million methamphetamine tablets were seized in 2018 - 17 times the total amount of the drug seized a decade ago. 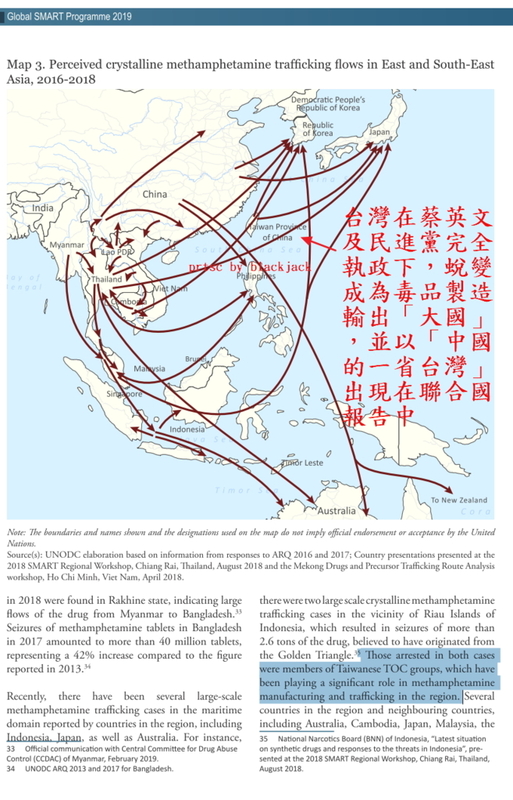 Aside from China annual seizures of methamphetamine in other countries also reached historic highs in 2018. 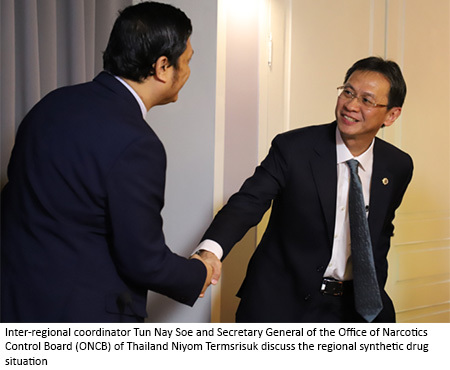 "Volumes of methamphetamine and other synthetic drugs originating from the Golden Triangle to Thailand have reached unprecedented levels", said Niyom Termsrisuk, Secretary General of the Office of Narcotics Control Board (ONCB) of Thailand. 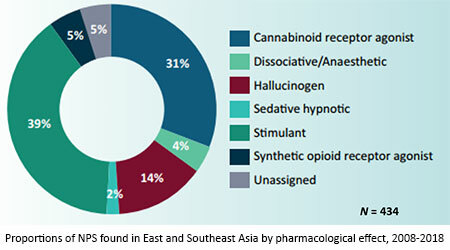 "Large amounts of synthetic drugs have been trafficked to neighbouring countries in the region, but also further. The challenge is growing, and it is critical we work with UNODC and the region to curtail flows of precursor chemicals that are being used to produce methamphetamine and other synthetic drugs." He added, "We will be discussing solutions with regional leaders when we host the Mekong MOU on Drug Control Ministerial Meeting in June of this year." 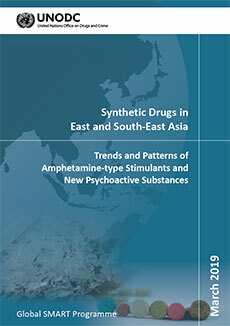 While the market for methamphetamine continues to expand rapidly in East and Southeast Asia, a wide range of new psychoactive substances (NPS), have also emerged in the region. By 2018, a total of 434 NPS were detected in the region, including potent synthetic opioids such as fentanyl and its analogues. The emergence of NPS is a significant challenge for national authorities and people in the region. "Aside from methamphetamine which is getting most of the attention because of the surge in seizures and street price drops, synthetic opioids and other drugs have also been found across the region", said Jeremy Douglas, UNODC Regional Representative for Southeast Asia and the Pacific. He added, "National leadership and authorities are starting to come to terms with how profoundly synthetics are changing the drug market, and we hope they use the coming Mekong Ministerial Meeting in Bangkok and ASEAN leadership meetings to reflect on the situation and their strategy - this is not business as usual, and it is past time to change the response." UNODC works closely with countries in the region to monitor drug trends and provide expert advice on detection, investigation and public health responses, and importantly to create space for countries to collaborate and respond together. Click here to learn more about the Mekong MOU.